Geberit 240.572.KA.1 Dual Flush Push Button. 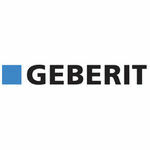 Geberit takes pride in providing over 40 countries across the world with top-quality plumbing products. They also take pride in creating and manufacturing Replacement Parts that are as durable and eco-friendly as the damaged or broken parts. All Replacement Parts are backed by a 1 year Washroom and Bathroom Warranty, and a 2 year Electronic Systems Warranty. This Geberit 240.572.KA.1 Dual Flush Push Button Is a Geberit Genuine Replacement Part designed for 115.942 Sigma/Kappa Dual-Flush Square Actuators. Both Push Buttons features a stunning Satin Chrome Finish. Shipping Dimensions 7.0" x 7.0" x 3.6"
Shipping Dimensional Weight 1.00 lbs. Push button, dual flush, for HyTouch WC flush control, Matte Chrome.